Home Food & Restaurants Starbucks Planning Starts… Now! Starbucks, the american coffee company with almost 300 stores in the Philippines, commence it’s Christmas Tradition Promo. 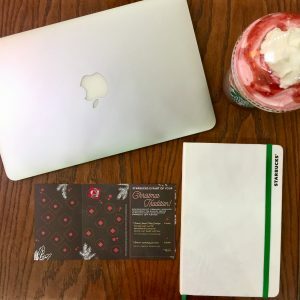 We can now start collecting stickers to redeem the Limited Edition Starbucks Coffee 2017 Planner. The Coffee and The Siren are the two new designs, which are both inspired by their names and are available in two sizes, the regular and the mini (i like to call it). As always, it comes along with a magnetic bookmark, erasable pen, pouch and coupons which you’ll definitely love. You may see them at first glance at Starbucks SM Lanang Premiere. 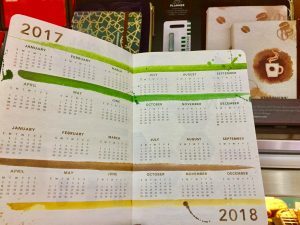 The inside is somewhat the same as before which includes your weekly and year long calendar, holidays and events and ultimately the writing space for your personal notes. 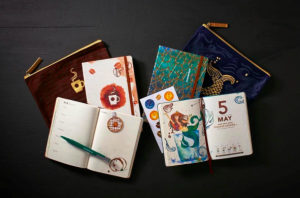 Planner enthusiast and avid sticker collectors are not new to this. 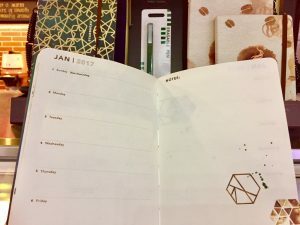 As for me, it’s going to be (just) my third year aiming for another planner edition. But for those who are new to this, let me tell you a little bit about the process of how it works. Present the promo card to the barista overtime you buy your Holiday Featured Beverages and/or any Starbucks Core Handcrafted Beverage. One beverage is equivalent to a sticker. Make sure the place the sticker on your promo card. In any case you forgot to bring your card, don’t worry, just get a new one for free as it’s allowed to combine up to (2) promo cards. Collect a total of 18 stickers, 9 featured plus 9 core beverages, and that’s it! 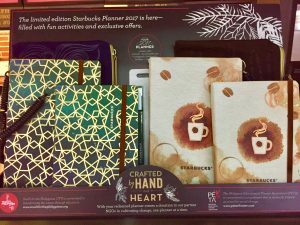 You’re qualified already for a redemption of a Limited Edition Starbucks Coffee 2017 Planner. Bulk purchasing of Gift Certificates and reloading Starbucks Card of at least P7,000 are other ways getting being entitled for a planner. Something that you have to re-think of, as it might double the cost of your coffee expenditure. Stickers collection starts November 2, 2016 up to January 8, 2017. Once completed go get your planner right away at any store in the country. Christmas season is here and holiday atmosphere is already in the air. Your Starbucks coffee experience will once again be at its peak. So what are you waiting for? visit the nearest Starbucks Store near you start collecting stickers now! Jeff is the Feature Editor and Technical Writer for Davao Eagle Online, an Internet publication and a community blog. From Manila he moved to Davao 3 years ago. He also works as an associate trainer in one of the BPO companies in the country. He loves to travel and write about what's new and noteworthy. He's recent travels are the highest summits in the Philippines (Mt Apo and Mt Pulag) and he also visited Silicon Valley (California, USA), home to many of the world's largest high-tech corporations and startup companies.